Pour milk into a saucepan and add in Thai tea leaves. Bring it to a boil and turn down the heat. Simmer for 4 mins. Turn off heat and cover with lid for another 2 mins. Strain the Thai tea milk and set aside to cool completely. Place softened butter, caster sugar, baking soda, eggs and sifted flour in a mixing bowl and whisk at low speed for a few secs before increasing to medium speed for 1 min until combined. Add in Thai tea milk and continue to mix at high speed for 30 secs. Scoop the batter into a muffin tin lined with cupcake papers. I like to use two large spoons for this job. Fill them about ¾ full and bake them in a preheated oven at 170°C/340°F for 20 mins or until a skewer inserted comes out clean. Whisk the softened butter and salt over high speed for 5 mins, until pale and fluffy. In 2 batches, add in the icing sugar and whisk at medium speed until the mixture thickens. Drizzle in the Thai tea milk and give it a final mix. 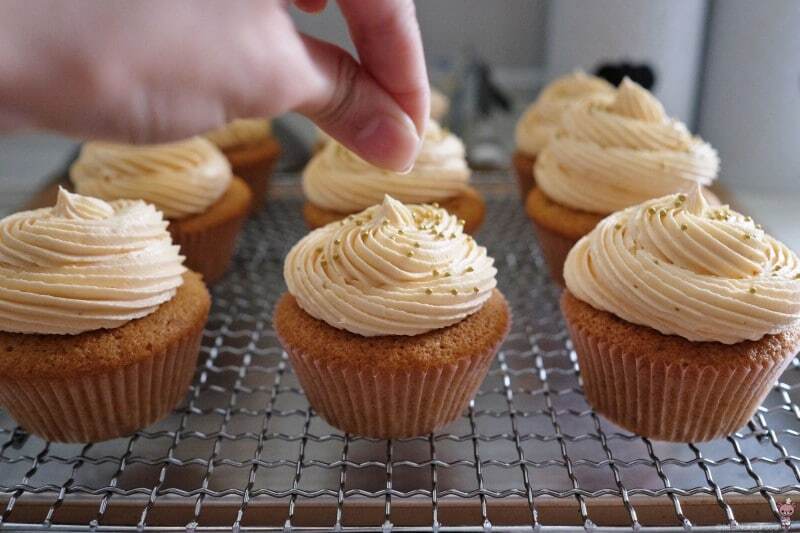 Pipe onto each cupcake and garnish with some sprinkles if desired. They keep well in airtight containers at room temperature for up to 1 week.